Here’s a man who’s accomplished the seemingly impossible -- making Lewis Black seem upbeat and Larry David positively cheery. 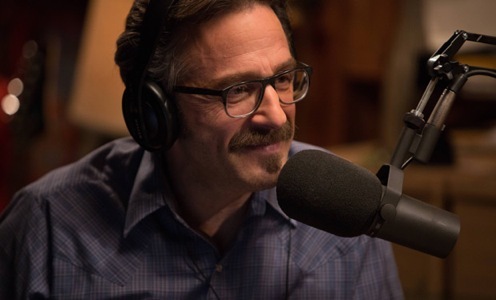 He’s Marc Maron, real-life host of the podcast WTF with Marc Maron and star sour ball of IFC’s darkly amusing Maron. Its 10-episode Season One launches Friday, May 3rd, with the network describing it as a “fictionalized version of Marc’s life.” Probably not that fictionalized, though. The first three half-hour episodes were made available for review, and each has a prominent male guest star. It’s Dave Foley in Episode 1 (subtitled “Internet Troll”), Denis Leary in “Dead Possum” and Judd Hirsch in “Marc’s Dad,” which also features appearances by Jeff Garlin and Andy Kindler as themselves. Maron, who logged more than 40 appearances on NBC’s old Late Night with Conan O’Brien, remains a living room, bedroom and guest bathroom shy of becoming a household name. But he does have a gloomily lit garage, from where his podcasts originate. Foley, who plays himself, is always game for just about anything. In “Internet Troll,” he’s A-OK with peeing behind a Glendale, CA dumpster. Even Maron is disgusted. “It’s OK. I hate myself,” Leary’s told before warning Maron he’s courting a “massive heart attack from pent-up anger.” The two of them then discover a bad smell afflicting Maron’s house. It turns out to be a dead possum in a crawl space. Will Maron, assisted by a kid named Kyle (Josh Brener) who idolizes him, find the fortitude to get in there and remove it? Hah! Take it from him, “If there’s gonna be somebody crying and panting in my house, it’s gonna be me.” Meow to all that.